To download the fourth issue of the magazine, click the below, complete the form, and it will be automatically emailed to you. You can also buy a printed copy of the magazine! It looks beautiful and is printed on good quality paper throughout 🙂 You can buy a copy here! You can also subscribe to the printed issues now. You will save money on the cover price, and also the postage. So why not subscribe to the printed magazine here! We are pleased to bring you the fourth issue of the magazine. VEGANS MEAN BUSINESS – Tim Barford looks at what's in store for vegan businesses and festivals in 2018. CAUSE FOR CELEBRATION – For Prue's birthday she asked her friends to watch a movie about animal exploitation. TIME FOR A TREAT – A selection of our favourite vegan products for those cold nights in. STARTING THE JOURNEY – Margaret Gambardella tells us what she wishes she knew at the start of her vegan journey. VEGAN CREATIVITY – Does a plant-based diet increase your creativity? Absolutely, says Jo Hodson. BEST NUTRITION QUEST – How to be a healthy vegan with nutritionist Ruby Berridge. CITY GUIDE: MOREISH MANCHESTER – Vegan Olive is spoilt for choice in the vegan utopia that is Manchester, here she gives us a tour of her favourite spots. DROP THE SCARE TACTICS – Angry vegans are wasting one of the biggest opportunities says Toby Channon. AUTUMN COLOURS – Nicole shows us a selection of beauty products perfect for the autumn season. THE TRIALS OF A VEGAN HORSE GUARDIAN – Can you be vegan and ride horses? Jane Antcliff-Wilson gives her views on living with these amazing and magical beings. A PASSION FOR BUSINESS – Entrepreneur Giles Cooper gives us some pointers for setting up a vegan business. ESSENTIAL AMINOS – “But what about protein?” Essential Aminos is where we should be looking says Chris Deojee. BADGERED TO DEATH – Justin Kerswell tells us why the only ethical response to the “cull” is to dump dairy. MY VEGAN STORY – Alida Gulamhussein tells us why she went vegan and how it started with yoga. REVIEWS – A review of Graham Burnett's book on permaculture. 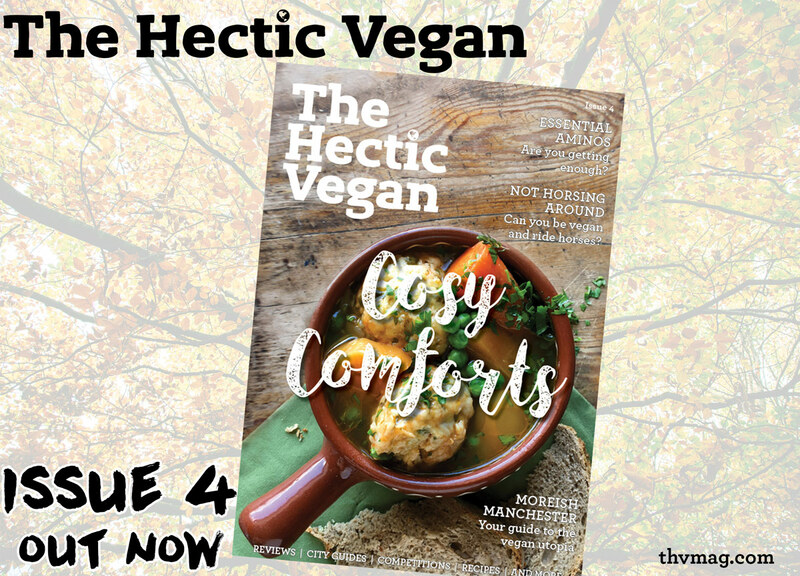 Plus reviews, recipes, competitions, vegan diary, and more! Hi, I'm Rich! I'm here to help you on your vegan journey no matter how far along you are :) For more info about me and The Hectic Vegan, head over to the About page.